MIDDLETOWN, Maryland — A gaggle of excitable white turkeys gobbled and clucked in their pen at Open Book Farm on a chilly afternoon in late October. Most days, the birds roamed free in one of the farm’s pastures, scratching and walking around under the care of owners Mary Kathryn and Andrew Barnet. In the spring and summer, the turkeys shared the 192-acre farm with chickens, hogs and cows. The turkeys soon joined the other animals in Open Book’s freezer after being slaughtered and processed. Open Book is one of many farms in the state that has received funds from government programs helping farmers. The programs help them develop conservation plans and pay for projects that include planting trees along riverbanks, and purchasing livestock fencing, water lines and pasture seed. Farming accounts for more acreage than any other single economic activity and is the largest contributor of nutrient and sediment pollution entering into the Chesapeake Bay. The constellation of programs across the United States supporting farmer conservation are funded by the farm bill. In this year’s five-year update of that bill, the House and Senate versions allocate different sums to these programs including the Regional Conservation Partnership Program. Legislators and conservationists have pushed for the Senate’s version of the Conservation Partnership funding, which lawmakers say would up spending to about $350 million. Leaders reconciling the two bills announced an agreement in principle on the 2018 Farm Bill, but have yet to release specifics. Approximately $220 million in partnership projects were funded across the country in 2018. More than $16 million of that was allocated to Chesapeake Bay region states. The Barnets purchased Open Book in 2015, and have received roughly $50,000 in assistance from conservation programs. The money has been crucial to their operation, Mary Kathryn Barnet said. 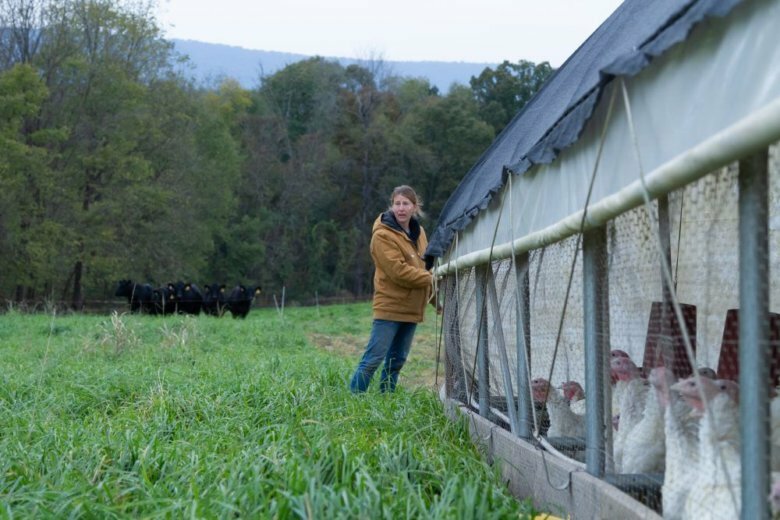 “If you don’t inherit a farm that’s running, the different programs can help you get the infrastructure, especially with animals, to get going,” she told Capital News Service. Open Book raises its animals on pasture. The livestock is rotated through a series of fenced pens, giving the grasses and clovers time to regenerate before the animals return. They live different lives than those on industrial farming operations. Those animals are restricted to small pens and live in close quarters with other animals. Their waste can be improperly stored or spread on fields pushing pollution into local waterways. Livestock waste and other types of fertilizer, rich in nitrogen and phosphorus, runs off cropland and even lawns boosting algae growth that blocks sunlight from seagrasses. When algae decompose, the process starves the water of oxygen, creating dead zones. The farm’s fences keep animals from trampling riverbanks, and a buffer of newly planted trees along streambeds reduce erosion, keep streams cooler and absorb some of the excess nitrogen and phosphorus running off the land. Open Book has also received funds from the Conservation Reserve Program, which pays farms to set aside acres of farmland along stream banks to plant stream buffers. Spreading too much or too little fertilizer is not typically intentional, said Lori Lynch, a professor at the University of Maryland’s Department of Agricultural and Resource Economics. Farmers don’t always have access to tests that can identify how much nutrients are in manure or already in soil, she said. Keeping animals like cows on pasture requires more acreage per animal, but farmers spend less to raise them, and animals spread their own manure while munching their cud. That works for some farmers, like ones who raise dairy cows — there’s less milk, but costs are lower per gallon, said Rob Schnabel, watershed restoration scientist for the Chesapeake Bay Foundation. “You’re getting more for what you’re producing, even though you’re producing less,” he said. Fencing animals out of streams can also prevent them from getting sick because they’re not picking up pathogens from river water, he said. For farmers that just grow crops, they can reduce erosion and nutrient runoff, as well as keep weeds down, by planting cover crops like cowpeas or barley when fields are fallow. “From a soil health perspective and an erosion perspective, if you can keep the ground covered all the time that’s a very beneficial thing,” Lynch said. In 1987, leaders from Pennsylvania, Maryland, New York, Virginia, West Virginia, Delaware and the District of Columbia comprising the 64,000-square-mile watershed agreed to set specific goals reducing pollution running off into the Chesapeake. The agreement aimed for a 40 percent reduction in nutrient runoff by 2000. The efforts were voluntary, and the goals were not met. Neither was a 10-year cleanup agreement signed in 2000. In 2009, President Barack Obama issued an executive order calling for the federal government to renew the effort to protect and restore the watershed. The following year, the U.S. Environmental Protection Agency set what it called “total maximum daily load” goals for states in the region. The EPA let states devise watershed implementation plans to achieve runoff reductions by 2025. This year was the midpoint, and the EPA’s assessment found that some goals have been met, but some states have done better than others. In the first seven years of the new plan, some of the biggest reductions came from upgrades to large pollutant contributors like municipal wastewater treatment plants, the EPA assessment said. “The low-hanging fruit has been picked, and part of that is wastewater treatment plants,” said Beth McGee, the Chesapeake Bay Foundation’s director of science and agricultural policy. The two outstanding areas that could be reduced most are urban and agricultural runoff, she said. To keep ratcheting down emissions, officials are working to get more farmers to adopt conservation practices because they are typically less expensive than building stormwater infrastructure in cities. The foundation has been pushing to plant more miles of stream barriers annually, but such plantings have declined in recent years, according to the foundation. About 55 percent of roughly 288,000 miles of streambank and shorelines in the Bay region are forested, according to the program. Scientists believe rivers and streams are healthiest when more than 70 percent of their edges are covered. Lynch says she believes that almost all farmers are practicing some kind of conservation on their lands, but some practices may not be the most effective or improperly implemented. “I think there is a pretty high number of people who are at least trying,” she said. A possible way to get more farmers to plant stream buffers, Lynch said, is to plant trees and bushes like walnuts or blueberries, which can become another revenue source. Leaders from both the House and Senate Agriculture Committees announced Thursday an agreement in principle on the 2018 Farm Bill has been reached. Specifics of the bill have not yet been released. Lawmakers from the Chesapeake Bay states sent a letter to the conference committee earlier this year requesting the Senate’s version of Conservation Partnership funding. The signers included Maryland Democratic Sens. Ben Cardin and Chris Van Hollen and the seven Maryland Democratic Reps. Dutch Ruppersberger (Timonium), John Sarbanes (Towson), Anthony Brown (Upper Marlboro), Steny Hoyer (Mechanicsville), John Delaney (Potomac), Elijah Cummings (Baltimore) and Jamie Raskin (Kensington). For farmers like the Barnets, the programs helped improve the bay’s health, and also gives them an opportunity to sell premium farm products that can fetch a higher price. As Mary Kathryn Barnet looked at a slope along a stream at the edge of her farmland, she said it was an easy choice to plant it with trees instead of trying to grow corn or soybeans.